Thirty-two year-old Jyochhna Padhan resides in Gobindpur village of Birmaharajpur block, Subarnapur District, Odisha, with her husband and two children, a girl and a boy. In 2012 Jyochhna developed erythematous lesions all over the body, for which she did not consult any doctor. Gradually she developed numbness and clawing of all the fingers in both hands by the end of 2013. Then her husband took her to a local quack and started treatment. Day by day she became week and was unable to do her house hold activities. The neighbours and villagers talked about her. Her husband took her to her mother’s village at Ainlapalli of Ulunda block, for treatment as her mother-in-law asked her to do so. Luckily for her a person from the same Ainlapalli village who himself had been cured of leprosy and undergone Reconstructive Surgery (RCS) informed LEPRA’s physio-technician about Jyochhna. Jyochhna was examined and it was found that her skin lesions were raised, new lesions had appeared and she had left foot drop and claw hands. Also she had become weak. She was put on Multi-drug Therapy (MDT) and after 10 months underwent 3 surgeries whereby her left foot and both claw hands were corrected. 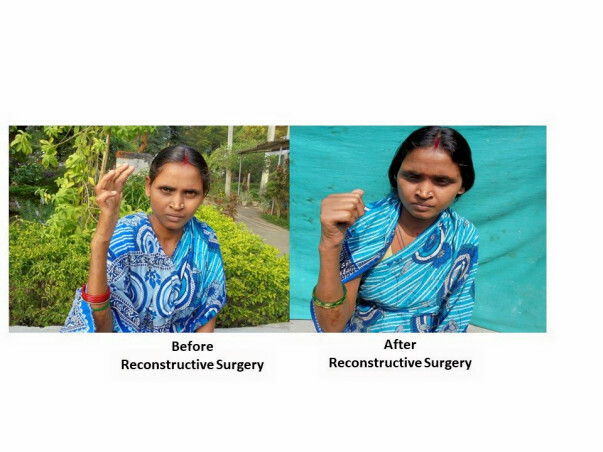 Now Jyochhna is able to lead a normal life thanks to the Reconstructive Surgeries. Not all women and girls are lucky to access treatment and services for leprosy whereby they can prevent the disability. LEPRA Society has been helping women and girls to undergo such surgeries free of cost in the states of Madhya Pradesh and Odisha. The whole surgical procedure for one limb (hand or foot) costs Rs 5000/-. We are happy one person has contributed but we would like more people to come forward to address this issue of deformities in women. After all women and girls also deserve to lead a dignified life free of stigma and discrimination!